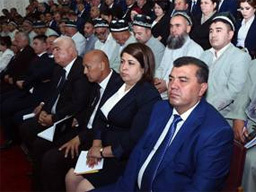 KHUJAND (Avesta news agency) — At a meeting in the city of Khujand with the Sughd region’s activists, President of Tajikistan Emomali Rahmon called yesterday for intensifying the fight against crime, including such phenomena as terrorism and extremism. Over the year and five months in the region, about 8,700 crimes have been solved, including 500 crimes related to terrorism and extremism, which is much more than previous years. As the result of operational search activities in the territory of the region, 275 members of terrorist and extremist parties and organizations have been brought to justice, 715 people are wanted for terrorism and extremism. According to him, this is mainly residents of cities and regions of Isfara, Istaravshan, Asht, Spitamen, Khujand, Panjakent, Y. Gafurov, J.Rasulova, Kanibadam, Mastchokh, Zafarobod, Buston, Istiklol, and Devastich. To date, 687 people have been returned from 715 people who studied in illegal religious institutions abroad, 81 of the region’s residents are still abroad. Among them are the people of Istaravshan, Khujand, Asht, Isfara, Kanibadam, Penjikent, Mastchi, B.gafurov, and Mountain Mastchas. In this case, it is necessary to widely use those points of legislation that exempt from criminal liability persons who voluntarily refused to participate in military operations in the territory of other states and returned to their homeland. At the same time, the head of state noted the increase in the number of serious crimes, including murders in the region. In the Gafurov district, 20 murders were recorded, Istaravshan 17, Kanibadam-12, Khudzhand-10, Isfara-9, Penjikent-7, J. Rasulov-6, Ashte-8, Spitamen-7 and Devastich-6 murders. In this regard, President Rahmon called on law enforcement bodies, leaders and representatives of the public in the Sughd region to intensify the fight against crime.